The leading cause of vision loss in older Americans, 60 and older, is ARMD. There are two forms of this disease, wet macular degeneration and dry macular degeneration. Both forms affect the central portion of the retina, which is the light-sensitive section located in the back of the eye. This part of the eye processes images and is essentially responsible for sight. The dry form of ARMD is more common than the wet form. In fact, almost 90% of ARMD is the dry form. The leading cause of losing vision in people over 60 years of age is macular degeneration. There are various risk factors, including smoking, obesity, and exposure to UV rays. Caucasians are at a significantly greater risk for contracting ARMD than African Americans. Additionally, macular degeneration affects women in greater numbers than men, and has a genetic component. Macular degeneration (also called AMD, ARMD, or age-related macular degeneration) is an age-related condition in which the most sensitive part of the retina, called the macula, starts to break down and lose its ability to create clear visual images. 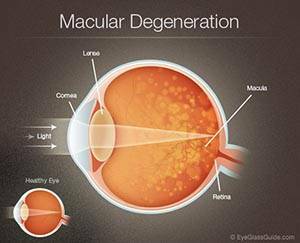 Dry macular degeneration symptoms include: consistent, slightly blurred vision within your central visual field. You may have difficulty in recognizing faces. And have a sudden need for more light while reading or working. The dry form of this disease gets progressively worse, over time. Wet macular degeneration symptoms include: a distortion of straight lines and an inability to focus properly on a single point within a grid. Wet macular degeneration is an advanced stage of the disease, and often results in blind spots and loss of centralized vision. Macular degeneration symptoms vary based on the particular form of the disease (dry or wet), and the stage the disease at the time it is discovered. There is as yet no outright cure for macular degeneration, but some treatments may delay its progression or even improve vision.